We all miss the hustle and bustle of mosque, and especially that feeling of spirituality that is special to the Holy month. We can try and maintain it over this relatively quiet month (mosque-wise) by going on Thursday nights – but for me personally, this is not possible with two young children to put to bed ready for school the next day. – The children choose a Name of Allah from the book ‘Call upon the Almighty – The Marvelous Names of Allah SWT’ by Binte Abbas Creations and we talk about that and try to learn that Name through the week. 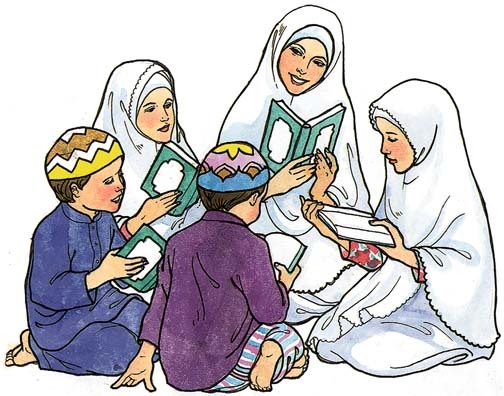 – The children choose a Sura to learn over a few weeks, and we look up its benefits from the book ‘Call upon the Almighty through His Marvelous Book, the Holy Quran’, also by Binte Abbas Creations. There are so many more ideas out there as to what can be included, depending on your child(ren) and how old they are! I have heard of some families with older children reciting Sura Yasin and Hadeeth-e-Kisa together. Maybe families with younger children can use that time to work on an Islamic craft project together, etc. Inviting grandparents, family or friends over for the Majlis can make it even more exciting and special. Writing the Name of Allah/Sura for the week on a white board where the whole family can see it everyday can help remind you to bring it up over the week too. I wish I could say I did this religiously every week but sometimes I just don’t manage – when we do do it however, I am pretty sure I am learning as much, if not more, than my two little ones! P.S. Do you hold something similar with your children? Please do share your ideas!